Be bold enough and try a new and rebel look. This cute girl is tired of her girly outfits and haircuts and she decided to try something unusual. She wants to look like a punk diva and you must help her. 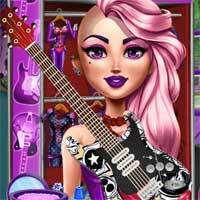 Follow the steps and give her a new haircut and makeup, dress her up and decorate her guitar. Have fun!